New Delhi, Feb 20: The Congress on Wednesday criticized Prime Minister Narendra Modi for breaking protocol to personally welcome Saudi Arabia's Crown Prince Mohammad bin Salman to New Delhi on Tuesday. Salman will be in India for two days and is expected to hold extensive talks with Modi on Wednesday. Salman's visit to India came a day after he signed deals worth $20 billion in Pakistan. The deals have become a topic of contention since ties between India and Pakistan deteriorated following the attack in Pulwama on February 14, in which 40 soldiers were killed. 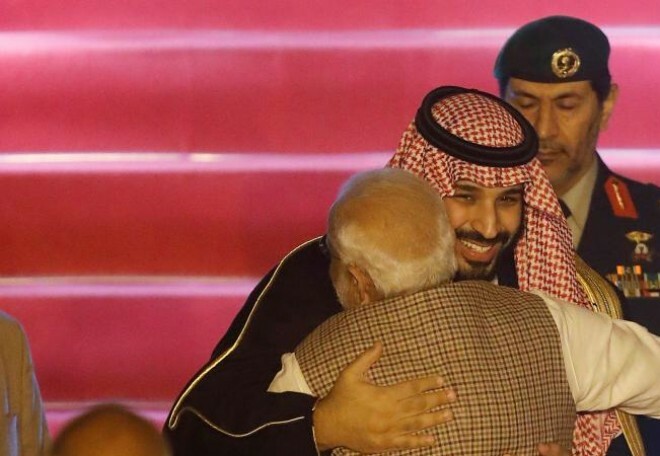 "By breaking protocol and welcoming Saudi Crown Prince Mohammad Bin Salman with such abundance – only hours after he promised billions to Pakistan – PM Modi has shown the country, the martyrs and every soldier in India what he thinks of their service [and] sacrifice," the Congress tweeted on Wednesday. "The prime minister ordinarily does not receive a foreign dignitary at the airport and instead sends a junior minister or an official. Ministry of External Affairs spokesperson Raveesh Kumar had tweeted on Tuesday about Modi "breaking protocol" to receive Salman and termed it a “new chapter in bilateral relations". The Congress said the joint statement issued by Pakistan Prime Minister Imran Khan and Salman had failed to condemn the terror attack in Pulwama and instead “praised Pakistan anti-terror efforts”. The party said this has undermined India’s demand to name Jaish-e-Mohammed a global terrorist. Salman had praised Islamabad for its efforts for regional peace and security.